With less than 2 months to go before the release of Pokémon: Let’s Go, Pikachu! and Pokémon: Let’s Go, Eevee!, today The Pokémon Company opted to drop a whole lot of new details on us, regarding battling Legendary Pokémon, the connectivity with Pokémon GO and a couple of other things as well. In the world of Pokémon, there are certain special Pokémon that are hardly ever seen. These Pokémon are known as Legendary Pokémon. 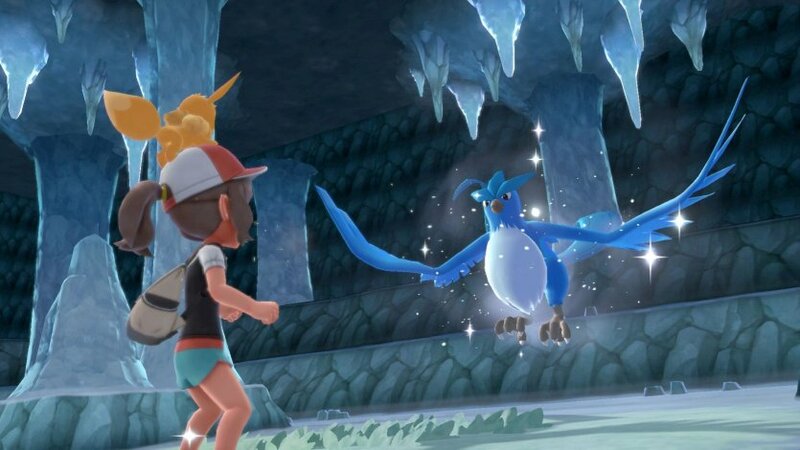 In the Kanto region, where you’ll be having your adventures, three of these Legendary Pokémon are Articuno, Zapdos, and Moltres. You won’t be able to catch these Legendary Pokémon the same way you catch most other Pokémon you encounter in the wild—you’ll have to defeat them in a battle first! Once you defeat them, you’ll have the opportunity to catch them. The GO Park complex is where your Pokémon will arrive after you’ve synced your Pokémon GO game with Pokémon: Let’s Go, Pikachu! or Pokémon: Let’s Go, Eevee! There, you’ll be able to see your Pokémon friends running around and having fun! The GO Park complex has a total of 20 GO Parks, with each capable of holding 50 Pokémon. That’s a whopping 1,000 Pokémon that you can keep! If you want to explore the Kanto region with the Pokémon you’ve brought over from Pokémon GO, you’ll need to catch them again in the GO Park complex first. Pokémon: Let’s Go, Pikachu! and Pokémon: Let’s Go, Eevee! can easily be linked to Pokémon GO through Bluetooth Low Energy (BLE) technology. Once you’re linked, all you’ll need to do is follow the simple instructions in your game to transfer Pokémon. There’s no limit to the number of Pokémon GO accounts that can be tied to a single save file in Pokémon: Let’s Go, Pikachu! or Pokémon: Let’s Go, Eevee! That means you’re not limited to connecting with just your own Pokémon GO account. You can get Pokémon from friends and family, too! Although Pokémon that you’ve brought from Pokémon GO into Pokémon: Let’s Go, Pikachu! or Pokémon: Let’s Go, Eevee! can’t be sent back to Pokémon GO, transferring your Pokémon over will earn you handy rewards in Pokémon GO that will help you in that game. Once you have 25 of the same species of Pokémon in the GO Park complex, you’ll be able to challenge yourself to a special minigame in the Play Yard. In the minigame, you’ll need to lead all the Pokémon into the goal area within the time limit. The Pokémon will all be doing their own thing at the start of the minigame, but they’ll start following you once you get close enough to them. Watch out for the obstacle Pokémon that appear from time to time, though. Bump into one of them, and the Pokémon you’ve been gathering will get surprised and run away! If you manage to get all the Pokémon into the goal area within three minutes, you win! Your prize is Candies, which will prove invaluable as you put together your Pokémon team. Pokémon: Let’s Go, Pikachu! and Pokémon: Let’s Go, Eevee! will feature Candies—items that are used to make Pokémon stronger. You can increase Pokémon’s stats by using Candies. There are different kinds of Candies, and each has a different effect. For example, giving Pikachu a Quick Candy will increase its Speed stat. Other Candies will increase stats such as HP or Attack. There are even some Candies that only have an effect on a particular species of Pokémon! Use all the different Candies wisely to raise a superstrong Pokémon! You’ll be able to acquire Candies by successfully completing games in the Play Yard of the GO Park complex. You can also send Pokémon to Professor Oak to assist in his research. He will give you Candies in return. It seems as though there are even more ways of getting Candies. Try taking one of your Pokémon for a stroll in a Poké Ball Plus—you might just get some Candies for your effort! Certain Pokémon have regional variants—that is, they have adapted to the unique environment of one specific region and look and behave differently from the same species found in other regions. The regional variants of the Alola region are known as Alolan forms. If you’ve caught Pokémon in their Alolan form in Pokémon GO, you’ll be able to bring them over to Pokémon: Let’s Go, Pikachu! or Pokémon: Let’s Go, Eevee! in that same form. But if you haven’t caught any, don’t worry—there are visitors from the Alola region in Pokémon: Let’s Go, Pikachu! and Pokémon: Let’s Go, Eevee! who will be happy to trade their Alolan form Pokémon with you.